Walpole in WA’s South West is a favourite stand up paddle boarding destination and has so much to offer that it requires a good few days to explore the area. It’s a 4 to 5 hour scenic drive from Perth with some gorgeous towns to stop along the way including Nannup and Bridgetown. This trip was planned as an “Orphans Christmas” for those of us who were free of festive obligations and it was a fantastic opportunity to escape the madness that this time of the year brings. 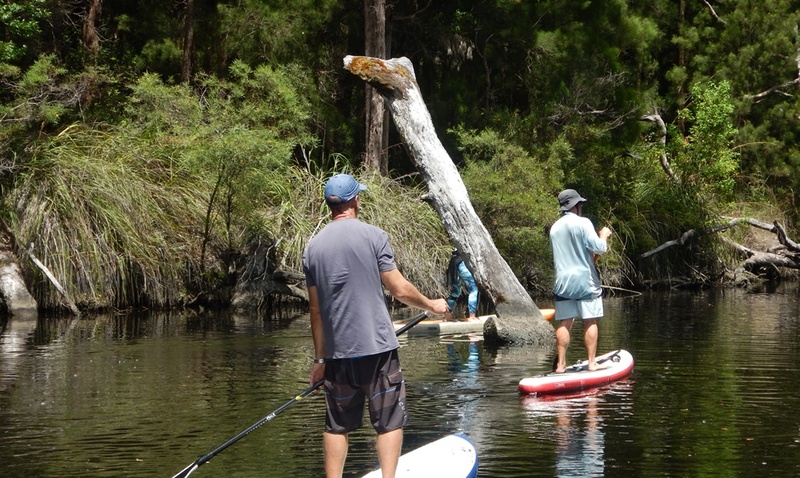 The agenda for us was paddle boarding and we did plenty of it however the main attraction of Walpole is the “Valley of the Giants” famous for its towering Karri and Tingle trees. Day 1 – we wasted no time! The wind was a howling south easterly across the Nornalup Inlet so we dropped the boards in for a quick downwinder. There was no access point on the other side so it was into the wind for about 1.7 km’s in shallow water (check out the video). Albeit, a great work out and down wind practice if you’re just starting out. Day 2 – Christmas morning was spent surfing at Ocean Beach Denmark which is a 60 km drive further South of Walpole. We had little ankle biter waves to play on and seeing as most of us couldn’t surf this was a blessing!! It’s perfect for learning to surf and there was a surf school running on Xmas day for the kids. I was surprised at how shallow it was so take care when you fall off – we did plenty of that! From here we headed to the picture perfect Greens Pool in William Bay National Park for Xmas lunch. There’s not a huge amount of parking for a busy day but luckily we all scored a spot after a short wait. If you want to SUP here take a small board for a float around the pool as there is a steep set of stairs to negotiate and you may clonk a few heads on the way down or damage your board. It’s a special spot so with or without a SUP it’s magical. Day 3 – was simply stunning paddling upstream on the Frankland River. We launched from the canoe ramp (opposite the Nornalup Riverside Chalets) and paddled as far as we could go until access became too tricky. It was about a 13.5 km meandering return trip and there were plenty of twists and turns and obstructions (fallen trees) to negotiate along the way. This made it all the more fun (but be careful) like a mini adventure so take some snacks and water with you and don’t rush it. Some sections were so enchanting, the bird calls almost beckon you to stop paddling and meditate – even if you’re not the meditating type, it’s mesmerising! We stayed at the Coalmine Beach Caravan Park and we were lucky to have one of the best locations (cabin #12) and was only a short walk across to the Nornalup inlet. You can carry your SUPS from here across the car park the down the stairs to the boat ramp. One thing to be mindful of when booking – we had a group of 6 single adults and although the chalet supposedly sleeps 6 it was not adequate for us. Not many parks cater for groups of mixed gender single travellers so if your budget is not an issue book a couple of chalets or consider tent sites and use the well facilitated camp kitchens and ablution blocks. In my opinion 3-4 nights was not quite long enough taking into account travelling time. I’m not a touristy traveller but I would liked to have had some more time to go for a walk in the national park or even do a stop over in Nannup or Bridgetown on the way home. Well, I guess I’ll just have to go back again…happy supping folks.